3-Eileen May Crothers, daughter of John Crothers and Julia Teresa Hally, was born on 19 Oct 1890 in Ringarooma, Tasmania and died on 8 Nov 1985 in Launceston, Tasmania at age 95. 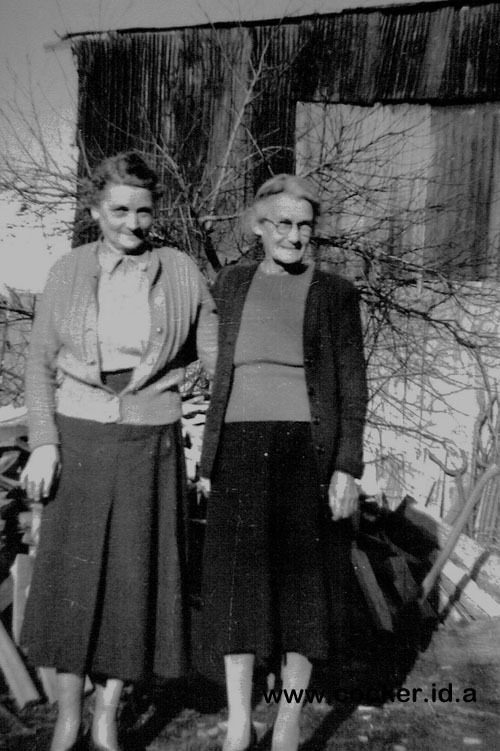 Pictured above are sisters Eileen and Eveleyn. 4-Mona Crothers was born on 3 Nov 1915 in Scottsdale, Tasmania. Mona married Vincent Tucker. They had seven children: Faye, Dawn, Margaret, Dorothy, Beverly, Tom and Helen. 5-Faye Tucker. Faye married Henderson. They had two sons and two daughters. 5-Dawn Tucker. Dawn married Fenton. 5-Dorothy Tucker. Dorothy married Last. 5-Beverly Tucker. Beverly married Pearce. 5-Helen Tucker. Helen married Carlon. They had one son and three daughters. 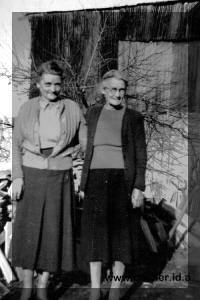 4-Gwendolen Crothers was born on 16 Nov 1917 in 181 Wellington Street, Launceston. Gwendolen married Guy Stanley Templeton, son of Thomas Templeton and Mary Ann Greig. Guy was born on 21 May 1915 in Invermay Road, Launceston, died on 24 Jan 1994 in Burnie Baptist Church at age 78, and was buried on 26 Jan 1994 in Launceston Garden of Remembrance. Another name for Guy was Tocky. He served in the Second World War. They had three children: John Philip, Unknown female and Nigel Greig. 5-John Philip Templeton was born on 25 Aug 1940 in St Ives Private Hospital, College St. Launceston, died on 25 Jun 2004 at age 63, and was buried on 1 Jul 2005 in Ulverstone, Tasmania. 5-Unknown female Templeton was born on 20 Oct 1946 in St Ives Private Hospital, College St. Launceston. 5-Nigel Greig Templeton was born on 19 Nov 1948 in Darwin Private Hospital, Burnie, Tasmania, died on 19 Dec 2005 at age 57, and was buried on 23 Dec 2005 in Burnie, Tasmania. Nigel married Colleen Leslie Eastley about Feb 1970 in Penguin, Tasmania. Colleen was born about 1950.